For the first time in history, Canadian anglers will have a team tournament series offering a chance to qualify for the Rayovac FLW Championship, and possibly earn a berth in the prestigious Forrest Wood Cup, without having to fish south of the border. FLW Canada has announced a three event series for the 2016 season where the top 10 teams from each event will earn a spot in the Canadian Championship. From there, the top two finishing teams (4 anglers) will advance directly to the 2017 Rayovac Championship. Each angler on the first-place team will compete in the Rayovac Championship as individual boaters – with fully rigged Ranger boats provided for the event – and each angler on the second-place team will compete as co-anglers. The FLW Canada qualifiers are scheduled for June 25-26 on the Tri-Lakes (Pigeon, Buckhorn and Chemong lakes); July 23-24 on Rice Lake and August 27-28 on Lake St. Francis. 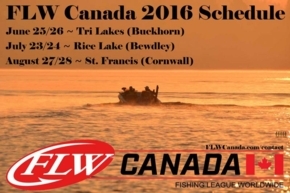 Full details and entry information are available on the FLW Canada website.